Bleached performs at Culture Collide this past October. Have you heard of that cool new concert venue in LA? Have some nutritional and organic food while browsing the vinyl isle as you listen to live bands. If you guessed Whole Foods then you are a total hipster. Whole Foods Market on 3rd and Fairfax will have their Concert Series this Friday (Dec. 13th) with and in-store performance by one of my favorite bands Bleached. The event, sponsored by Filter Magazine wil also include signings and appetizers, beer and wine!! Also, according to the flyer, besides healthy foods, Whole Foods has now completely turned into the coolest grocery store in the world by carrying vinyl records. "Vinyl records? Yeah, sure. Vinyl records are on isle 8, next to the roasted seaweed snacks." 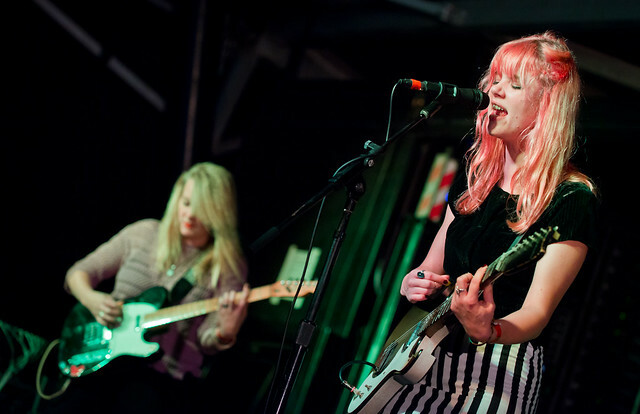 Ride Your Heart, the new album from Bleached, will be available for purchase.